Our trip starts from the port of Hora Sfakion. 10 people on board and a speed boat that ensures we reach Gavdos island within an hour. Our first stop is Potamos beach, sandy with amazing canyons on the background. Next, we travel along the rugged southwest coastline, admiring the rock formations carved by the elements up to the southernmost point of Europe. Τhere is a giant chair advises us to “Relax and Smile!” and so we do, then making our way to Karave port, taking our mini bus to Korfos for a wonderful lunch with magnificent views. Last stop Agios Ioannis beach, voted as second most beautiful of the world by Travel Channel in 2007. A sandy beach with sand dunes and cedar trees, which offer shade for hippies staying there for a couple of weeks or even months! An unforgettable experience, a trip back to the 60s and 70s, when naturism was the way of life. Photo Contest 2016 – “Photo Of The Day” it has already started for 4th year. 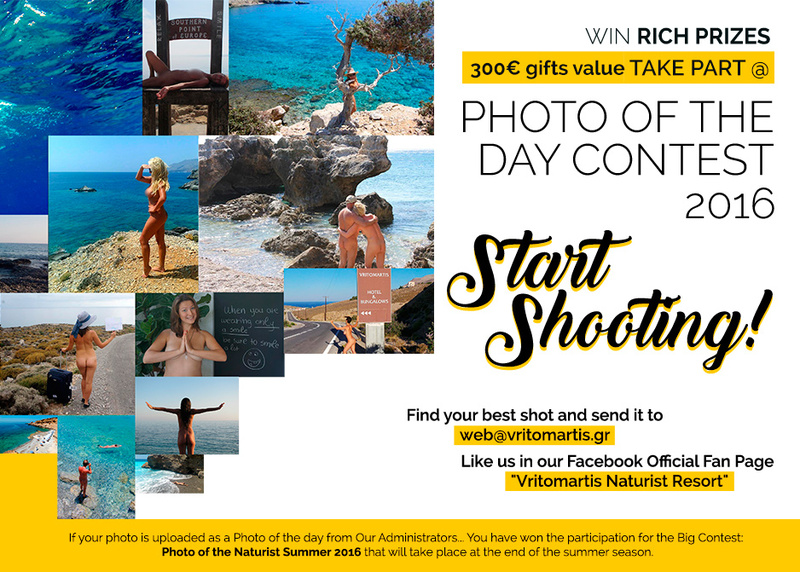 The photo contest will run all summer from June,1st until October,31st. We invite you to think creatively and capture your memorable holiday experiences through camera clicks. If yes, then in 3 simple steps you get the chance to win 300€ prizes. 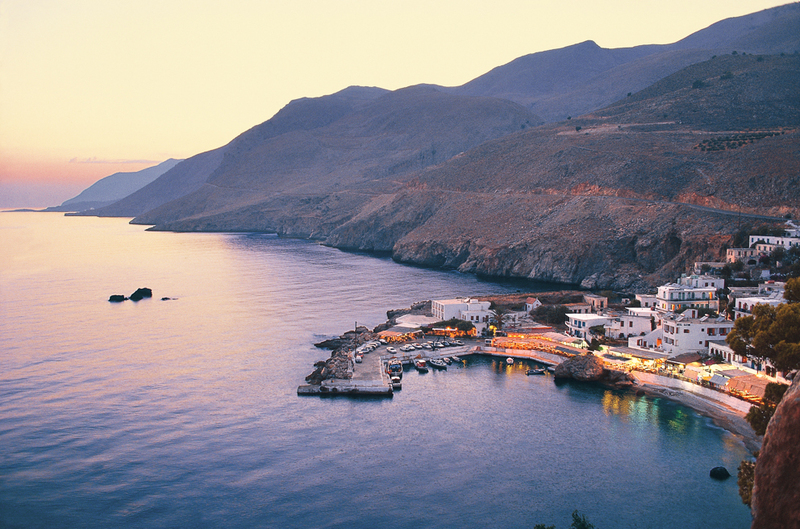 Sfakia lies in a mountainous area in the southwestern part of the island of Crete, in the Chania regional unit. If Sfakia, is your destination, you will probably have driven, bused or taxied over the White Mountains ( Lefka Ori ) from Chania and elsewhere on the Northern coast, a journey that is memorable for the view. Our first experience was in June 2015 and we have already confirmed another at June 2016. From the naturist places we have visited so far, Vritomartis is our most beautiful experience. The 7 days we stayed at Vritomartis we enjoyed the beautiful pool and surroundings, we attended collective games several times a day and also took sun and sea bathing in the beach nearby. We set off in 2014, after thinking back and forth a couple of times, to book a stay at Vritomartis for our second honeymoon during July 2015. Coming from Finland you would expect us to be easy-going skipping around in the buff but it took some mental preparation especially for the male part even being the initiator to the idea. The inner Hercules was fighting the idea of showing the outer Hercule Poirot without the usual suit to cover up all the good life that had been collected over the last 20 odd years. It was our first time in Crete and we really enjoyed this beautiful island and although we have a pool at our garden in The Netherlands the weather is not always cooperative. When we arrived at Vritomartis we were very pleasantly surprised by the very warm welcome that made us feel at home. As I am handicapped there is always a need to make some adjustments and understanding by the accommodation and also this was easily done by the employees. I brought with me an electric fold scooter to get around and it was no problem to use my scooter at the hotel, to the pool, to the bungalows and the other surroundings. Last summer I tried with my wife vacation in Crete, just to get a little warmer because the summer was gloomy in France. Luckily there is a naturist hotel in the southwest of the island in an arid part. Vritomartis hotel is like an oasis in the desert! An unforgettable memory of George and Elizabeth. We will tell you about our first visit to Crete and hotel Vritomartis. It happened at the end of June in the summer of 2013. Μe and my girlfriend Eli left for the dream island of Crete. Due to the long road we chose to travel by bus to Athens and then by ferry to the second largest city of Crete – Chania. After a long journey on motorways we arrived at Athens and we got on the ferry. 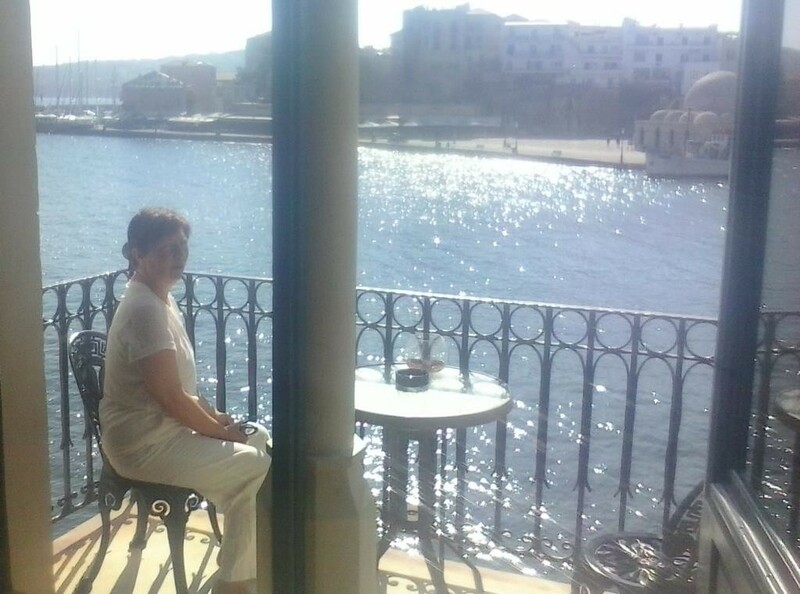 After a romantic night on the ship “Eliros” we landed at the port of Souda in Chania town in the early morning. We got on the bus that takes us to the small town of Chora Sfakion. Road passing through a passage of the majestic mountain Lefka Ori. The moment we stepped on Crete we were fascinated by the grandeur and beauty of the largest island in the Mediterranean. This is a story from our first visit to Vritomartis many years ago. We had flown from the United States, changed planes in Athens for our flight to Chania, and then driven the little French rental car that we named “Gigi” over the mountains to Vritomartis. After unpacking and having dinner, we skipped the orientation talk and went straight to bed. The next morning, we decided to go to the beach, but having skipped the orientation talk we were unsure how to get there. We missed the road to Filaki Beach and instead found ourselves driving down an unpaved road toward a secluded cove. We knew this must be the wrong place, but it looked pretty, so we parked Gigi and got out our towels and snorkeling gear. How do Nudists and Nudist Resorts deal with erections?